Get ready for a super scary Halloween carnival! An evening full of trick-or-treating, ghoulish games, freaky fun and frightening food! An event so nice, Warner’s is doing it twice. 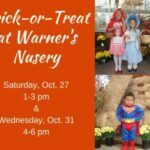 Bring your children out for some Halloween fun at the Warner’s Nursery Trick-or-Treat events on Saturday, Oct. 27 and Wednesday, Oct. 31. Don’t forget your costumes! 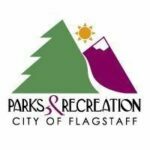 Calling all Goblins, Ghouls, and Ghosts! 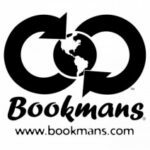 All Hallows Eve is upon us and Bookmans Flag has got the spookiest celebration in town. Join Saturday, October 20th from 11 am to 4 pm for the first annual Trick or Treat Monster Meet. 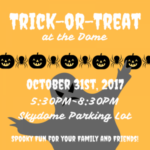 Come out to the Skydome parking lot and enjoy some spooky fun activities and trick-or-treating this Halloween, courtesy of the National Residence Hall Honorary at NAU and other participating campus organizations.